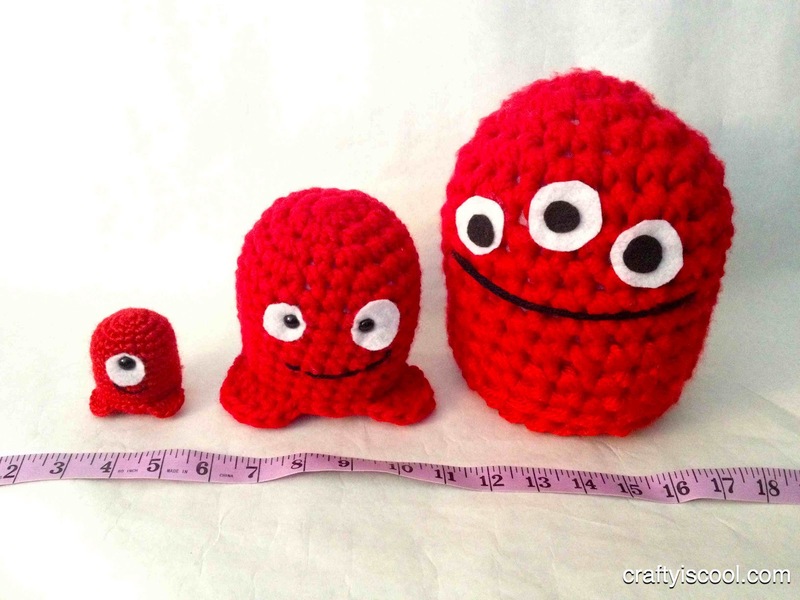 CRAFTYisCOOL: Back to School and Back to Stitching! Back to School and Back to Stitching! This year, all three of my kids, for the first time, are in school. The littlest started kindergarten and we're all still trying to get used to it. I miss my little friends at home! The upside, of course, is that I have more time to do things at home. Working moms and stay at home moms alike, I'm sure, welcome that "Back to School" season when they can start getting just a little more time to work on a few projects. Some projects you could actually do while your kids are at school and finish by the time you drive to pick them up or before they hop off the bus! I kid you not. How about greeting your kids with an afterschool snack AND an afterschool plushie? Using my Baby Monster pattern, I was able to whip up three monsters in just a couple of hours. I used the exact same pattern and look at the results I got! 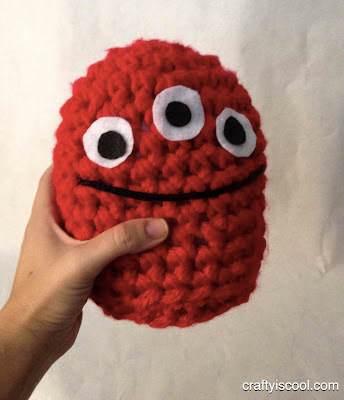 My Baby Monster pattern was written to make little pocket-sized monsters, but I wanted to experiment with using chunky yarn and bigger hooks. Let's take a look at what I decided to use. 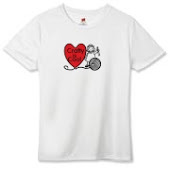 I used my original pattern, reprinted below, adding feet to a couple of them, but keeping the rest of the pattern the same. I used felt for the biggest monster's eyes. Starting at the top of the monster’s head, with desired yarn and an corresponding hook (see above), make an adjustable ring, chain (ch) 1, and single crochet (sc) 6 stitches into the ring. Pull the ring closed with the loose yarn tail. Fasten off OR continue on to make feet. 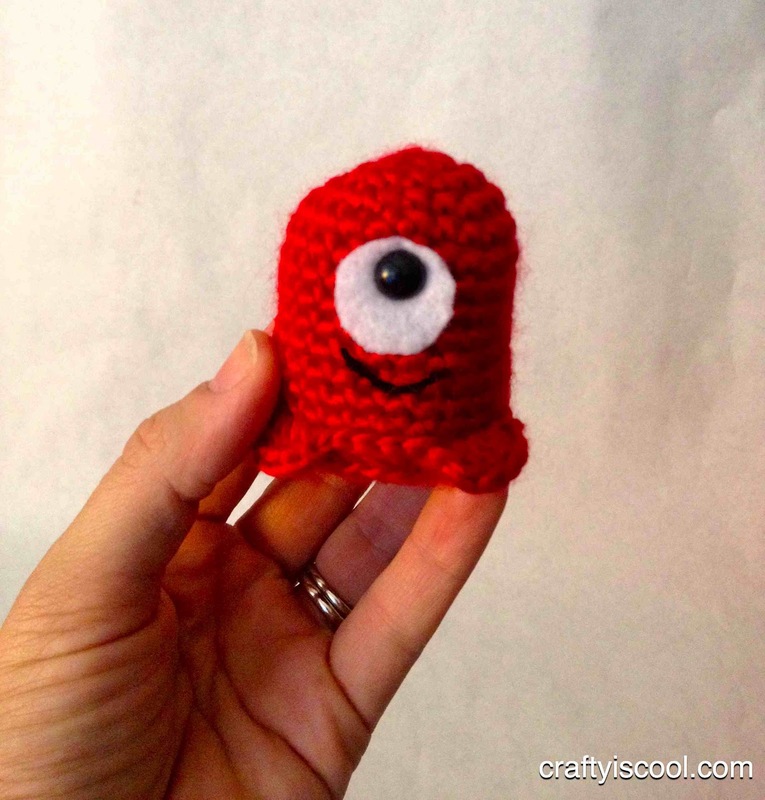 Make an adjustable ring, chain (ch) 1, and single crochet (sc) 6 stitches into the ring. Pull the ring closed. Insert safety eyes if desired, following package directions. For a child-friendly toy, use a safe fabric glue and arrange felt shapes to create the features. Stitch a smile with black yarn and a yarn needle. Line up the stitches from the base with the stitches of the bottom row of the body and begin sewing them together, stitch to stitch. Stuff the body fully before closing up the last few stitches and tucking the end inside. 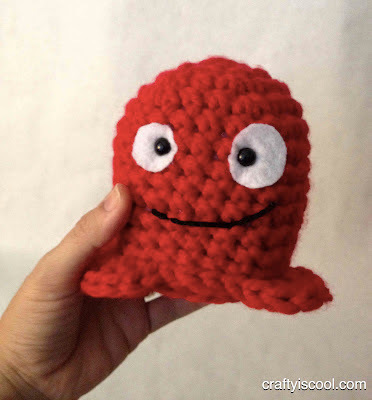 Using a regular D hook and worsted weight yarn gives you a cute little monster that would be adorable as a keychain (just add a loop of elastic and keyring to the top). Upsizing to a larger hook and chunky yarn makes a bigger monster that's just as cute but more huggable. Using the largest hook I had, a Q, and double stranding the chunky yarn, I got an awesomely chubby and squeezable stuffed monster! 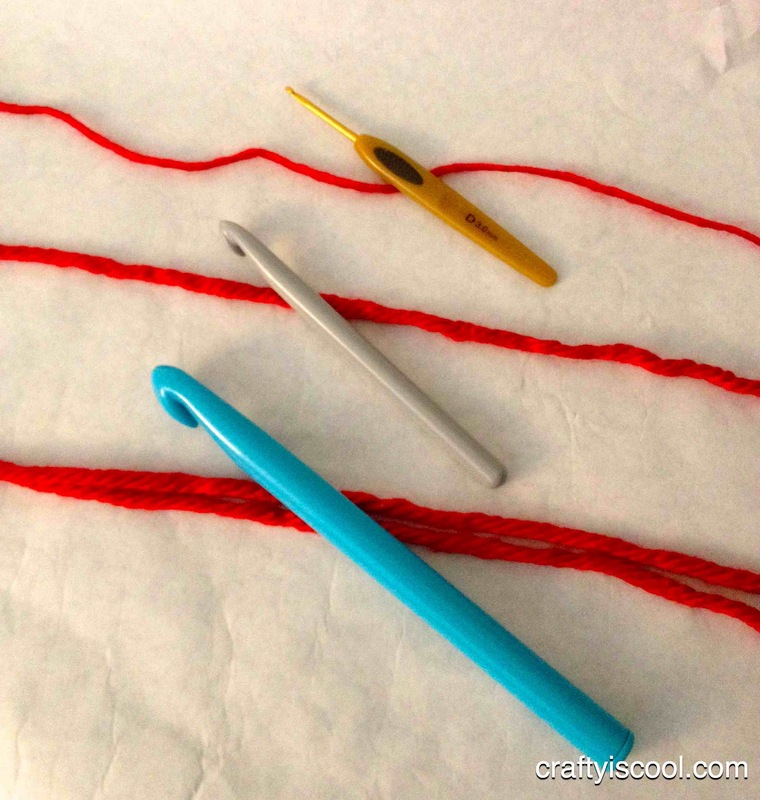 Hold two strands together while you crochet, following the same pattern, and use a really big hook. What a difference! 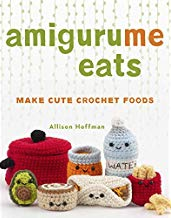 Although it takes a little getting used to, crocheting with a large hook and thick yarn can even be used in amigurumi! Who knew? 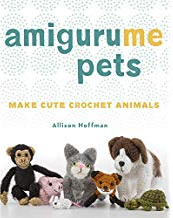 As always, it is best to keep your stitches as tight as possible, even with the huge hook and yarn, because big holes in your fabric will mean stuffing showing and coming through. 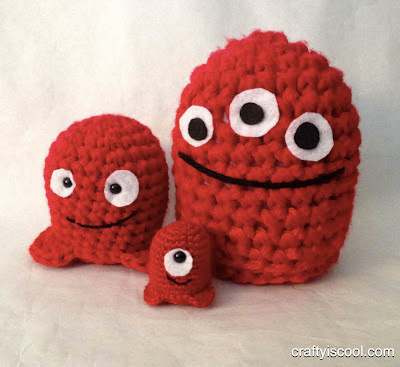 With all of the available colors of Bernat's Softee Chunky (which has recently gotten even more chunky, by the way) I foresee a rainbow of big chunky Baby Monsters decorating children's playrooms, teachers' classrooms, and Halloween mantles everywhere! Of course if you still love the little ones, Vickie Howell's Sheep(ish) and its trendy color range is where you will definitely find some inspiration. 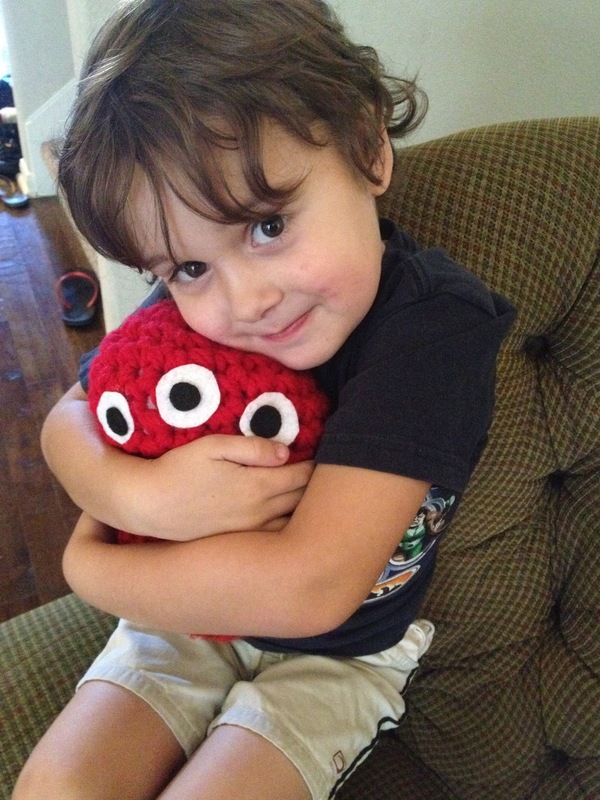 Lovin' his new chunky Baby Monster! Those are so so so ADORABLE! 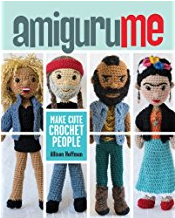 I did something like that with the Human Beans from Knitting Mochimochi By Anna Hrachovec. Thanks so much! Yep, playing with gauge is super fun and gets the job done quick, huh? Love these!! Super cute!!! I have a holiday bazaar coming up...do you mind if items are sold that are made from your pattern, if we reference your site and that the pattern is yours? it would be such a great item to add to our table! You have a wonderfull blog! :D Im so impressed!